Incident Details: While the previous incident was in progress, a 21 year old female slipped on some slippery roots at the edge of Derwentwater, and fell 2 metres on to rocks below. She injured her ankle. Given the commitment of the Team to a larger incident, the police were asked to page Cockermouth MRT to assist. 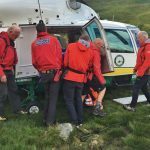 Fortunately five Keswick Team members who had not been available at the beginning of the previous incident were able to attend, and with the assistance of a boat from the marina, were able to transport her to Nichol End, where she could be loaded into an ambulance. Cockermouth Team were asked to continue until it was clear that the issue was resolved, and were then stood down. Our thanks to them for being so willing to come and help. 5 Team members + 7 Cockermouth MRT – 55 minutes.